We’re just weeks away from #GivingTuesday, a 24-hour global movement on December 1 when charities, families, businesses, community centers, and students around the world come together for one common purpose: to celebrate generosity and to give. #GivingTuesday is a great online fundraising opportunity for your nonprofit, but how you manage communications to promote the day determines your success. In case you don’t yet have a game plan or haven’t customized your Donation Page to make the most of #GivingTuesday, check out our previous blog and recent webinar with DonorPath to get things rolling. Ask a board member or sponsor to match gifts for the day or for certain hours during the day. You can use this to incentivize new or larger donations during your #GivingTuesday campaign. Rally your community. Talk to small businesses in your area to see if they will team up to support your organization on #GivingTuesday. Suggest a percentage or proceeds from sales that day or ask if they’ll collect donations on your behalf at their place of business. They might also want sponsor a matching gift. If you have a print shop nearby, recruit their help to produce flyers you can distribute (be sure to include your website address or QR code for donations). Many donors work at companies that double the donations made by employees. In your communications, encourage your donors to submit matching gift requests for their #GivingTuesday donations. Build momentum with your supporters in advance and communicate a consistent message across several channels, including email. Send an email a week before December 1, describing #GivingTuesday, announcing your participation, and telling supporters how they can help. Ask them to watch for more information and updates on your social media channels—and suggest they forward the email to friends to spread the word. Email supporters again on #GivingTuesday with a specific appeal for donations. Convey your sense of urgency for these 24 hours. And point them to social media for posts throughout the day about your progress. Start promoting #GivingTuesday at least a week before Dec. 1 on your social media. That gets supporters excited and prepared for the big day. Tease any creative or unique campaign you have planned. Use photos to be as engaging as possible and turn up the fun. Encourage your supporters to post “unselfies” showing how they’re participating in #GivingTuesday or how they feel when they support charity. Or post pics of your team demonstrating lots of #GivingTuesday spirit. Throughout #GivingTuesday, keep followers apprised of how donations are coming in for your overall goal. It’s as easy as checking your real-time, online Donation Report on JustGive. Donors love watching a campaign in progress and knowing they can help you reach your goal. Follow up the next day to share your results with supporters and say thank you again. For more helpful tips, download the logos, graphics and free Toolkits from givingtuesday.org, including ones for social media, press releases, PR and email. 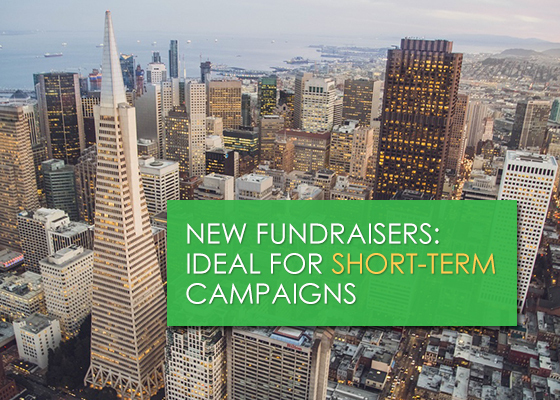 We’re pleased to announce our new and improved fundraisers product. JustGive has offered online charity registries for a long time, but we recently overhauled the product, made it easier to use, gave it a fresh look and feel, and rebranded it. Fundraisers are a great way for individuals to raise money for their favorite charities . . . and they’re also a creative, compelling way for your nonprofit to engage supporters in a short-term giving campaign. Our fundraisers include many customization features: custom colors, photo or video, campaign fundraising goal and real-time progress tracking, a custom thank you message for donors, program designations, custom URL, and much more. #GivingTuesday is coming up on December 1, and creating a Fundraising page is a perfect way to raise money for the global giving day event. Actually, these Fundraising pages would work well for any holiday-specific campaigns you have planned. To get started, visit the Fundraisers page. It’s only takes a few minutes to set one up! Note: You’ll need to create a regular donor account to use the new fundraisers, but rest assured any donations you receive through your Fundraising page are tracked and displayed in the Donation Report in your nonprofit account. We recently teamed up with DonorPath for a #GivingTuesday nonprofit webinar: 6 Weeks to Increase Engagement and Revenue. The webinar offered helpful strategies for making the most of this global giving day on December 1. #GivingTuesday has quickly become a worldwide phenomenon. In 2014, 30,000+ charities, nonprofits, corporations, community groups, and government agencies participated. How do you best prepare for this 24-hour fundraising event, which falls right in the middle of your year-end giving initiatives? To find out, download the free presentation from our recent webinar here, and check out the valuable tips below. DonorPath’s best advice? Identify your advocates. These are highly engaged supporters—both online and offline—that will help you, through their networks, drive donations on #GivingTuesday. 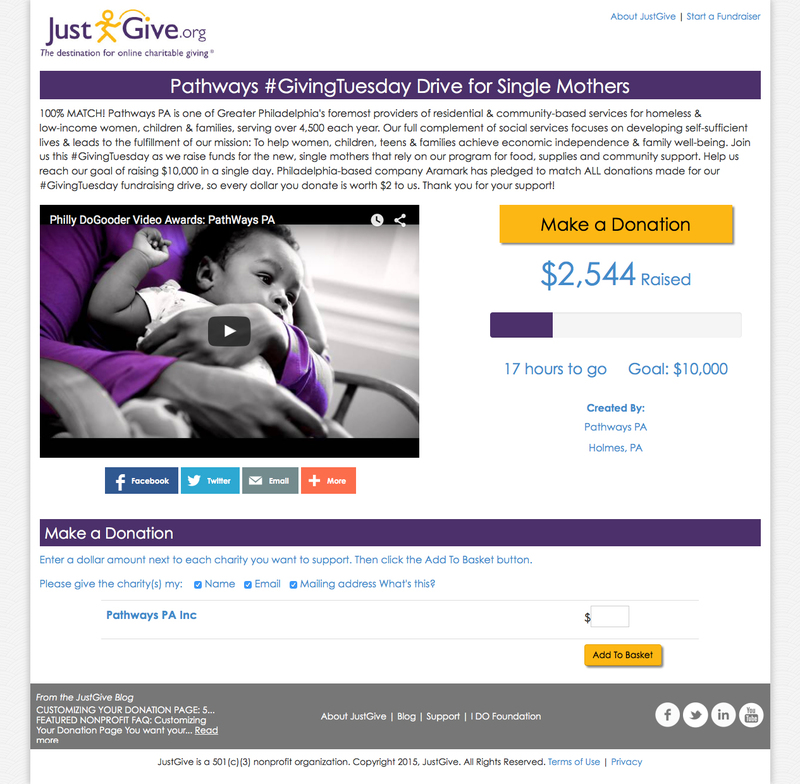 As a JustGive nonprofit, you can easily customize your online Donation Page for #GivingTuesday. Add a #GivingTuesday top graphic and message on your page, customize your donation amounts and descriptions, and include a special program designation for #GivingTuesday. The more your donors feel connected to the #GivingTuesday theme and tie-in, the more likely they are to participate in the movement. Or you can use JustGive’s new Fundraiser pages: they’re perfect for short-term campaigns like #GivingTuesday. You can quickly create and easily motivate donors through a campaign-specific page with compelling content like photos or video, customize colors, your goal and deadline. Note: You’ll need to set up a regular donor account on JustGive to use a fundraising page, but rest assured the donations will show up in your nonprofit report. #GivingTuesday only lasts 24 hours so it’s important to make the most of your communications. Build momentum and awareness with messages you send to supporters and social media posts leading up to the day. Then email your supporters early in the morning on #GivingTuesday, asking them to donate through your JustGive link, and encouraging them to follow your progress on your social media channels. Throughout the day, log into your JustGive Donation Report to see how much you’re raising . . . and use this information to update supporters through social media, and even a follow-up email later in the day. Let them know how close you are to meeting your goal—and encourage them to spread the word and continue giving to reach it. Be sure to consistently use the #GivingTuesday hashtag in all your online communication. And make it easy on yourself with ready-to-use materials: visit the #GivingTuesday website for free toolkits, sample messages, logos, and more. While GivingTuesday officially ends at midnight on December 1, DonorPath recommends you take advantage of the day after to say thanks and retain the support you received. Organize a “thank-a-thon” with your staff and board members to thank your #GivingTuesday supporters, communicate how much you raised, and share where the funds will go. Donors like knowing they made a difference. Here’s to planning for a successful #GivingTuesday! It’s already begun: it’s not even Thanksgiving yet, and the holiday season is everywhere. Babies R’ Us was playing Christmas carols last week, and Target has the candy, decorations and gifts out in full force. I find it a little bit exhausting, don’t you? My goal for the holiday season is always the same: Simplify. This year I’ll be sharing how I do this, right here on the JustGive blog. For me, a big part of creating a simple and meaningful holiday season is about redefining the season itself—which means less stuff. With less stuff, I feel less stress. I started working at JustGive earlier this year, and was thrilled to learn about Charity Wishlists for the holiday—it’s a totally new concept to me. As much as I love the thought behind gifts, I really don’t need anything. By creating a Charity Wishlist, I can raise money for my favorite charities instead of receiving gifts from my family and friends. And that makes me feel better than any piece of jewelry or retail gift card ever could. Here’s my wishlist for the season—check it out, and consider creating one of your own! This year at JustGive, we’ve created an exciting new Holiday Gift Guide to make giving more meaningful. It’s filled with charitable gifts that show you the impact your donation has on the world. Choose from 12 of the timeliest issues, including hunger, job support, LGBT rights, and peace—there’s a gift for every budget. Charity Gift Cards are perfect for someone you might not know that well (a holiday gift for a co-worker, for example), for a friend or family member who has a charitable heart, and for those hard-to-buy-for people on your list. You choose the amount for the gift card, and they choose the charity (or charities!) to receive the donation. There are email, print-at-home, and physical cards – and more than a million charities on JustGive they can donate to. One of the coolest features (in my opinion) is the ability to buy your gift cards ahead of time, and then schedule them to be emailed whenever you’d like. Another fun option is to upload your own photo, making for a very personal gift. If you know someone who cares about a specific cause, a charity collection is a unique and great gift. Each collection includes four charities working toward a particular cause. There are 16 causes to choose from, including Animals, Arts, Education, Homes & Jobs, and Military. Check them all out here. What better way to create a more peaceful, simple holiday season than to get others involved too? After you make a commitment to help others this holiday season, spread the word to your friends and family. You can start a new tradition and include charity as part of your gift exchanges. You can also join JustGive in the #GivingTuesday movement, which counters the consumerism and commercialism of Black Friday and Cyber Monday. We’ll be offering an amazing deal to help you give more generously, too—so check JustGive on November 27 or sign up for our newsletter to hear all about it. How will you celebrate the holiday season? Do you incorporate charity or volunteering? Comment below or join the conversation on Facebook!